Little Brook Orchids is a family owned and operated orchid business comprised of a retail store and an eight greenhouse complex. Located in Lancaster, Pennsylvania, the business began as a hobby in 1989 when owner John F. Pyfer, Jr. started collecting and growing orchids in his home greenhouse. As John’s collection grew, so did the need for more growing space. 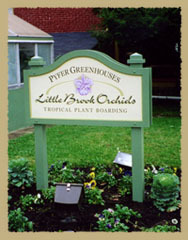 In 2002 he purchased the 1950s era greenhouse complex at 25 Rider Ave. After extensive renovations, Little Brook Orchids opened in late spring of 2004. John’s son Trey Pyfer, and some part-time help, manages the day to day growing and selling operations. Carol Pyfer, John’s wife, does the bookkeeping.